I can't argue with budget skincare, especially if it works well for me. I adore my stash of Origins, but sometimes you can become a little heartbroken when something runs out and you are too broke to repurchase. I have resorted to finding drugstore staples that allow me to try even more products out and minimise the heartache. 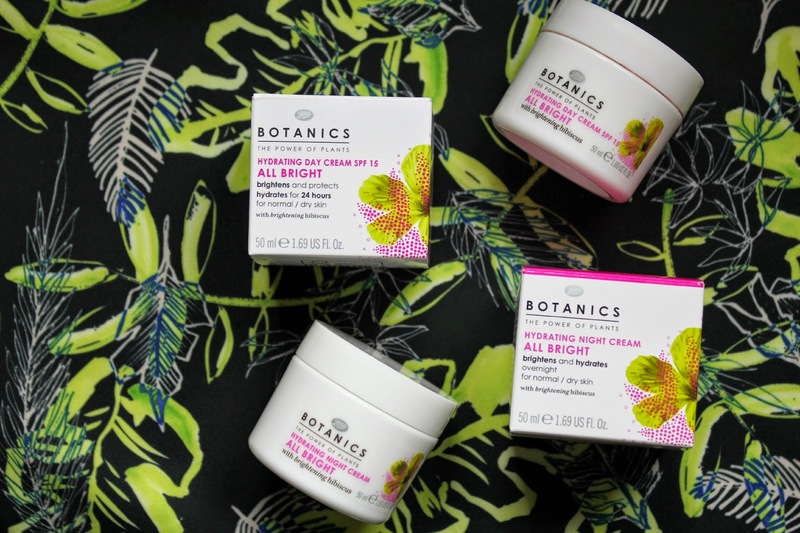 The Botanics All Bright range is something Megan got me interested in, and as my day and night creams were hitting the last few days worth of product, I scoured the shelves Boots to locate the Hydrating Day and Night Creams, and it was worth it. They have that slight idea of a very gentle chemical exfoliant too, with the brightening hibiscus added in. The Hydrating Day Cream SPF15 not only hydrates, but also protects the skin with the SPF incorporated in there. It is quite a light texture but when you work it into the skin you feel the hydration coming through - I'd say it'd work for most skin types. They are both quite salmony in colour and have quite a nice scent to them which I can't put my finger on, but nevertheless it gets some brownie points from me. The Hydrating Night Cream ditches the SPF, is thicker, and is slightly darker in colour. The consistency of this is quite luxurious yet not too heavy at all, and you can definitely tell the difference between the day and night offerings. For a mere £4.99 each (but often on some kind of offer), I would recommend trying these out for a purse-friendly kick of hydration, especially as the weather turns a little cooler.